ANGER is writ large on each one’s face at the gates of Chennai-based Ramco Industries Limited in Bihiya. “Are they planning to kill us?” a woman shouts showing a glass full of yellow fluid. 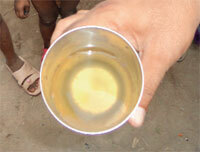 The murky fluid is the water people of this area in Bihar’s Ara sub-division in Bhojpur district drink every day. A bunch of company workers closeby claim in the recent months four of their colleagues developed skin ailments, three suffered paralysis and two died. Since August 2, workers and those living close to the polluting unit have been on an indefinite strike. With a production capacity of 120,000 tonnes per annum, Ramco started operations in July 2012. Now, stacks of broken asbestos can be seen strewn all across Bihiya. Residents allege the company releases smoke and dust from its chimney late in the night, which has caused skin diseases among people. Many complain of eye problems and strange cough. Water from handpumps in the area is severely polluted. “The company dumps asbestos waste in a deep pit on its premises, which has polluted groundwater,” says Rajmuni Devi, resident of Tipura Mathua village. Navodaya Vidyalaya, a residential school housing 376 students, is close to the asbestos unit. Gopal Krishna, convener and founder of non-profit ToxicWatch, says medical examination must be conducted in every asbestos unit by an occupational health expert. 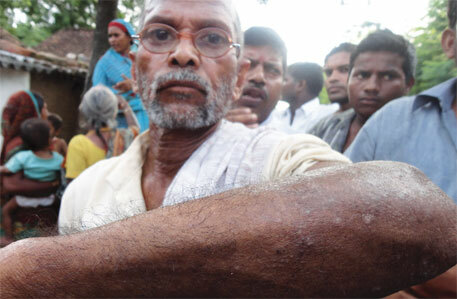 “The management conducts regular health check-ups, but never gives us the medical records,” says worker Kamlesh Singh. “Eight months ago, a worker was paralysed. The company removed him without paying compensation,” says Bhim Singh, another worker. “This apart, we are forced to work for 16 hours in a day without overtime payment,” he adds. “Instead of fulfilling our demands, Ramco fired eight workers,” says worker Lal Bahadur Mahto. They had a frontal role in leading the protests, say people. Furious over the sacking, the workers decided to go on hunger strike on August 12. As many as 52 people on company’s payroll and 54 contractual workers were on strike to protest labour harassment and demand better health facilities. The hunger strike was called off on August 16 after the Bhojpur subdivisional officer assured them that labour problems would be solved. The indefinite strike, however, continues. As many as 55 countries have banned production of asbestos as the World Health Organization as well as the International Labour Organisation prohibit its production. Both the organisations warn of carcinogenic risks of asbestos fibres. In case of Ramco, the stand of the Bihar State Pollution Control Board (BSPCB) appears equivocal. The board mandates that no asbestos unit should be established within 500 metres of human settlement. Ramco has villages dangerously close to its unit—Tipura Mathua village is barely 20 metres away, Navaduha village is around 150 m from the unit and Vasadiya Khadra village 60 m away. Earlier this year, BSPCB had cancelled the no-objection certificate of the proposed Utkal Asbestos Limited (UAL) because a school and some villages were within 500 m of the plant. UAL has approached Patna High Court against the cancellation. “If UAL was not allowed to operate, Ramco, too, should be asked to stop operations,” says Krishna. BSPC officials did not comment on this claiming the 500-metre clause was sub-judice. Repeated attempts to contact Ramco officials failed.